Kyoji Horiguchi was already considered one of the best pound for pound fighters in the sport but he just cemented his spot by defeating Bellator bantamweight champion Darrion Caldwell at Rizin 14 in Japan. 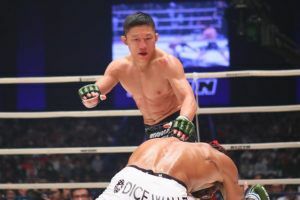 With the support of more than 30,000 fans in attendance, Horiguchi was going up against a bigger, stronger opponent who has been on a tear recently while also competing at featherweight. In the early going it appeared that Caldwell’s size and power were going to be enough for him to secure a victory as he was able to use his length to keep Horiguchi at the end of his punches before swooping inside for the takedown. Horiguchi refused to just give up once he got outwrestled and was doing everything possible to work back to the feet, which forced Caldwell to try and maintain control rather than do much damage. Towards the end of the first round, Horiguchi landed his best strike of the fight with a straight push kick to the gut that sent Caldwell flying backwards. The second round saw a more concerted effort from Caldwell to use his wrestling to outgrapple Horiguchi and that game plan worked to perfection. Caldwell got Horiguchi down early and then just continuously dragged him back to the mat. The problem Caldwell was having involved maintaining control and then doing any kind of damage as Horiguchi made him work for every second of the round. In fact, Horiguchi out struck Caldwell in the second round albeit only with small, peppering shots while defending the takedowns. The third round saw more of the same except Caldwell was starting to slow just slightly while Horiguchi was light on his feet and ready to press the pace, knowing he probably needed the finish to secure the win. Caldwell still managed to rush forwards and get a big takedown except this time he left his head and neck exposed and Horiguchi finally saw the opening he had been waiting on all night long. Horiguchi quickly pounced on the guillotine choke as he fell to his back, locking up the submission and Caldwell tapped out almost immediately after he got caught. Horiguchi jumped in celebration as the crowd roared in approval as he pulled off the upset over the Bellator champion with a third round guillotine choke submission. 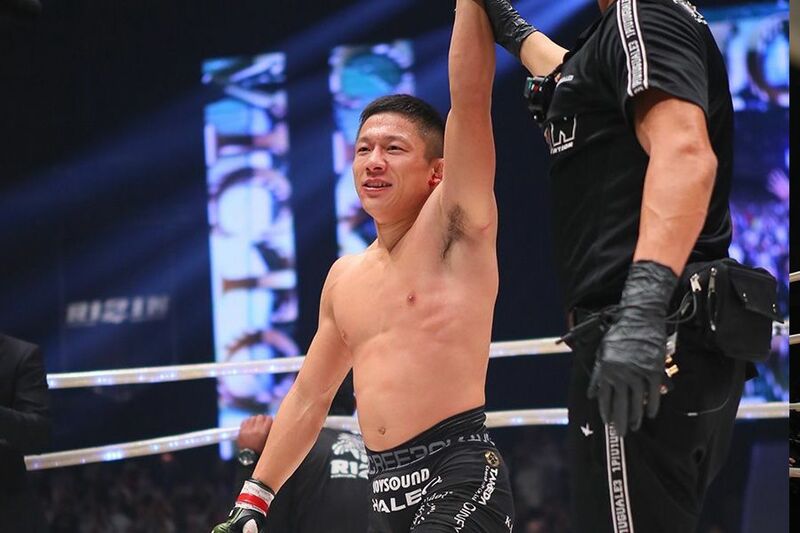 Horiguchi is now the Rizin bantamweight champion but his rivalry with Caldwell is far from finished as there was a rematch clause when this fight was made, which means will now go to Bellator in 2019 for a second fight against ‘The Wolf’. Experience counted in the fight to crown the first ever Rizin super atomweight champion as Ayaka Hamasaki dominated Kanna Asakura before earning a second round finish with a nasty armbar submission. While there was a lot of hype around the 22 year old Asakura going into the card, it was Hamasaki who showed off a better striking arsenal and ultimately her ground game as well. Throughout the opening round, Hamasaki was landing her right hand through Asakura’s defense as the up and coming Japanese prospect just couldn’t find a way to close the distance. Every time Asakura attempted to get a takedown, Hamasaki was able to shrug her off or reverse to take a dominant position on the ground. The second round saw Hamasaki once again getting the better of the exchanges on the feet and when Asakura shot in for a takedown she once again found herself struggling to maintain control. Her inability to finish the takedown led to Hamasaki getting a better position on the ground, where she then found an opening for the armbar. Hamasaki went for the submission and Asakura did everything in her power to get free as she rolled, twisted and turned but ultimately ended up on her back with her arm extended out. As Hamasaki extended the elbow, Asakura was forced to tap out to call a stop to the contest or risk further damage being done to her arm. A former Invicta champion, Hamasaki has now added the Rizin super atomweight title to her collection with this latest victory while an emotional Asakura was left in tears as she walked towards the back, disappointed in her performance. Hamasaki once again proved that she is one of the best women’s atomweight fighters on the planet as she picks up another lopsided victory and a championship belt to boot. Jiri Prochazka built his winning streak to seven straight with a knockout against former Bellator and PFL fighter Brandon Halsey. It was a bit of a bizarre match because, after the fighters exchanged some heavy blows on the feet, Prochazka moved out of the way of a takedown attempt and the American just flopped through the ropes. For a moment, as Halsey was clutching his back, it looked like he was too injured to continue. Eventually, Halsey got back into the ring but he was then punished with a yellow card for falling out of the ring with a 20% fine being taken from his purse. Once the fight was restarted, Halsey was able to turn the tables on the Czech fighter after the action hit the ground as he nearly wrapped up a rear naked choke submission but Prochazka was able to fight his way free. Once he got loose of Halsey’s grasp, Prochazka reversed positions to get on top as he began raining down a hellacious series of punches that eventually rendered his opponent unconscious. Following the victory, Prochazka said that he hoped to soon become the Rizin light heavyweight champion and then also mentioned the possibility of facing off with MMA legend Mirko Filipovic in the future as well. Brazilian monster Gabi Garcia remained undefeated with a quick first round submission over kickboxer Barbara Nepomuceno. Garcia promised going into the fight that she would be willing to stand and strike with her opponent and that’s exactly what she did through the first few exchanges. Garcia even managed to land a few shots while Nepomuceno was just constantly throwing huge over hand rights to get the knockout. Garcia eventually fell back to her grappling base with a big body lock takedown and from there it was just a matter of time before she grabbed onto the arm to get the finish with a keylock while Nepomuceno looked like a fish out of water on the canvas. Following the end of the fight, Shinobu Kandori, who was supposed to face Garcia in a previously scheduled match until the Brazilian badly missed weight, charged into the ring shouting at her while security and her team held her back. Kandori was eventually dragged out and the entire scene looked staged but, either way, Garcia celebrated her victory while getting another submission win on her resume. Following his release from the UFC earlier this year, Damien Brown was anxious to get back on a winning track but Rizin did not give him an easy fight for his debut as he took on knockout artist Daron Cruickshank. To no one’s surprise, Cruickshank was constantly looking for the explosive combinations that would earn him the spectacular finish on the feet. During one particular exchange it looked like Cruickshank had Brown stunned with one of his punches but the Detroit native wasn’t able to surge forward to put further damage on his opponent. Meanwhile, Brown was pressing forward to close the distance on Cruickshank to stay away from his powerful kicks, which ended up being a very effective game plan. With time running out in the first round, Cruickshank altered his strategy and decided to go for a late takedown and it backfired almost immediately. Brown saw the opening for a guillotine choke and he immediately latched onto Cruickshank’s neck before securing his guard on the ground. Cruickshank tried to slip free but he wasn’t able to break free of Brown’s grip and he was forced to tap. Brown starts off his Rizin career with a huge win and afterwards he called for a fight against Takanori Gomi, who was sitting nearby with a bird’s eye view of the Aussie’s first round victory and subsequent call out. The opening bout on the main card saw 44 year old Miyuu Yamamoto showcase a dominant ground game over all three rounds to get a unanimous decision win over Mika Nagano. Yamamoto, the sister of Japanese fighting legend Norifumi ‘Kid’ Yamamoto, obviously carried on her family’s legacy with an impressive showing in her latest performance. Yamamoto’s son had come up short earlier in the night but she was obviously able to put all that behind her as she stepped into the ring with her kids sitting in the front row to watch her compete. The preliminary card at Rizin 14 was also stacked including a pair of rarely seen submissions in mixed martial arts. Kazuyuki Miyata finished out his career with a chicken wing submission against Erson Yamamoto, Miyuu Yamamoto’s son, in a spectacular finish in the preliminary card headliner. Miyata had already announced that this would be his retirement fight and he definitely delivered by pulling off the eye-popping submission that had Yamamoto grimacing from the pain until he was finally forced to tap out or have his arm snapped. 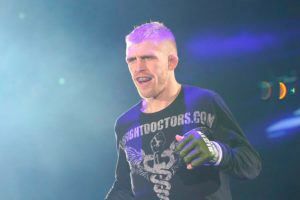 Former UFC fighter Johnny Case got back on track with an impressive showing against Yusuki Yachi in a largely one sided contest that saw the American dominate the majority of the fight until it was finished. Yuki Motoya gave a rude welcome to another ex-UFC fighter as Justin Scoggins made his RIZIN debut but then fell to a teepee choke submission. Motoya had nearly wrapped up a triangle choke but Scoggins was defending well enough to stop him from locking down his legs to finish the submission. That’s when Motoya made the adjustment to extend his legs, wrap his ankles together and squeeze while creating tremendous pressure on Scoggins neck and head. The end came just a few seconds later as Motoya got the submission victory. Ulka Sasaki had a strong showing in his first appearance in Rizin after leaving the UFC earlier this year. He put on a true MMA display with good striking and a suffocating ground game to dominate Manel Kape over three rounds to get the decision win. Newcomer Justyna Haba also silenced a raucous Japanese crowd as she choked out popular up and coming fighter Shinju Nozawa Auclair in their bout on the prelims. Haba locked up the rear naked choke near the corner and Auclair tried desperately to fight out of the hold but she just couldn’t break free. Rather than tapping out, however, Auclair ultimately went to sleep as Haba got the submission win. There was also an event in the same venue earlier in the morning entitled Heisei’s Last Yarennoka. 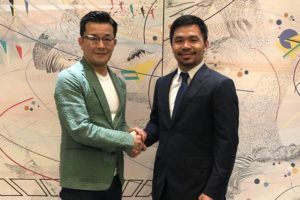 You can see the full results for that here and read about Tenshin’s exhibition match with Mayweather here.